Michael Bottos, Vice President of 1st American Management, has been accepted into the Institute of Real Estate Management (IREM) Fast Track program toward attaining his Certified Property Manager, CPM, designation. Over the next 18 months Michael will be working and learning along with other industry professionals across the country to attain this elite designation in the property management field. All of us at 1st American are very proud of him and his leadership in our firm. 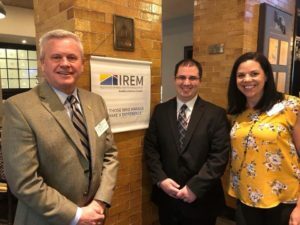 Pictured below are Michael, center, along with 1st American owner John Marshall CPM and IREM Chapter 100 President Jamie Ruiz CPM. 1st American Management Co, Inc. is working with a third party site called RentPayment through whom you can pay your assessments, either online or by phone.